A captivating read which will keep you guessing! A tightly woven story full of secrets and lies with a breathtaking finale. London 1920 – Troubled young dancer, Lily, is invited to remote Elmridge House, home of the wealthy theatre benefactor Dr Cuthbertson to escape her troubled past. An isolated guest room and a surprise pregnancy leave her longing to return to the stage and her London life. She soon discovers that Elmridge House is not all that it seems – the house holds secrets which make it difficult for her to leave. Missensham 1942 – Young nurse Ivy Watts is called out to a patient at Elmridge House, home of the aloof Mrs Cuthbertson and reclusive Dr Cuthbertson. Ivy is entranced by the opulence of the house and its glamorous past, but when she tells her mother about Mrs Cuthbertson, her mother becomes fearful and forbids her from returning to the house. What secrets does Elmridge House hold? And why does Ivy's mother live in fear of the mysterious Mrs Cuthbertson? Perfect for the fans of Lesley Pearse and Susan Lewis. A fantastic book! A wonderful stand-alone read - I didn't realise until I finished that it was part of a series. In the 1920's Lily ended an exhausting season as the prima dancer in a troupe and is invited to Dr. Cuthbertson's large country home to rest and relax. But neither the doctor nor his home are what they first appear. Twenty two years later, in the same area, a young nurse attends a patient at the same house. Are the two events related? And if so, how? This is a riveting book; lots going on and every event has a question mark - or two surrounding it. Things unfold at their own pace, but this is far from a dull read! With plenty going on, both then and now, there is more than enough detail to keep the reader's attention. Had I realised this was part of a series, I would have read the other books first but none of that takes away from the fact that this is an excellent stand-alone read and is very entertaining indeed. With lots of questions being raised, every one is answered before the final page - that's my kind of read! Definitely an author to add to my ever growing list of 'must read agains'. 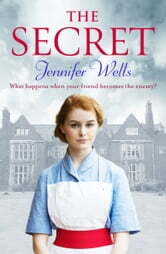 The Secret by Jennifer Wells has us journeying back in time to 1943 in Missenham, England. Ivy Watts is a nurse at Missenham Cottage Hospital. One Sunday she gets a call to Elmridge House owned by Dr. & Mrs. Cuthbertson and she hurries over on her bicycle. Ivy is fascinated by the beautiful home and the mysterious people who inhabit it. Hugo Cuthbertson loans her an old fashioned woman’s yellow coat and Ivy finds an old photograph in the pocket that features ballet dancers. One of the women in the photo is Mrs. Cuthbertson. Ivy tells her mother about the visit and she becomes upset. Ivy’s mother forbids her from returning to Elmridge House but refuses to tell her why. What secret is her mother hiding? Is it why she never leaves the house? In February of 1920, Lily is invited to Elmridge House by Dr. Cuthbertson, an investor, to rest after the latest ballet production. A short term visit is extended after Lily finds herself pregnant. Lily misses the hustle and bustle of London and she especially misses dancing. The nurses at Missenham Cottage Hospital could provide a solution but is it the right choice to make. Lily soon finds herself confined to her bedroom at Elmridge House and learns that the house holds secrets. Can Lily find a way to escape? Ivy can feel that something is not right at Elmridge House. The past is the key to resolving the questions Ivy has, but getting those answers proves difficult. The Secret is an intriguing historical novel. Ivy has newly completed nursing school and was happy to get a position at Missenham Cottage Hospital where she can visit her mother on Sunday afternoons. The hospital is run by two nurses, an assistant, and one doctor (nurses and doctors are in demand with the war on). It is commonly known in the area that if a woman finds herself in a certain situation, she can visit the cottage where the nurses reside for assistance. They also provide family planning advice which was unexpected in either time period. Bridget Bradshaw is the other nurse at the hospital and Ivy’s housemate. While Ivy helps match babies to couples who cannot have their own children, Bridget handles the other clients. The two stories slowly play out with it alternating between 1920 and 1943. It was interesting to read and see how the two storylines tied together. We get to see how the past affects the present and the lasting effects it can have on relationships. We also see how secrets can change a person’s behavior. I did wonder at the extent of Ivy’s nursing knowledge. She failed to ask the right questions and seemed oblivious to the services Bridget performed (she always had Ivy stay upstairs). I did like Ivy’s relationship with Hugh. Ivy was comfortable with him and I enjoyed the banter between them. One thing I found curious was Ivy was to stay with Hugh while his mother was at church, but Ivy always left before Mrs. Cuthbertson returned. The ending is delightfully unexpected. Readers will be captivated by Jennifer Well’s new historical novel, The Secret.